I know few things stress people out more than newborns and trying to get them onto the routine they are hoping to achieve. For most newborns, one of the hardest things to achieve is to establish “waketime” after each feeding during the day. I wanted to offer some encouragement to hopefully help you relax and take the process in stride. On Becoming Babywise addresses the difficulty, “Attempts to keep awake this sweet bundle simply are not successful. That is okay.” And then this important sentence: “Wakefulness is a goal to strive toward” (page 107). Did you catch that? It does not say that you must have waketime following every feeding or your child will be a complete failure, and of course you are then a complete failure by association. No. It says it is a goal to strive toward. Goals take time. Therefore, you can’t expect to achieve this goal immediately. It takes work, consistency, and time. Also remember that eating and diaper change are “waketime.” When you consider that most newborns can only be awake for 30-45 minutes at first, it takes at least 20 to eat then 5ish for the full diaper change, that doesn’t leave you with much. So at first, you won’t be having much time spent doing anything other than eat and change diapers. Some babies are a little harder. 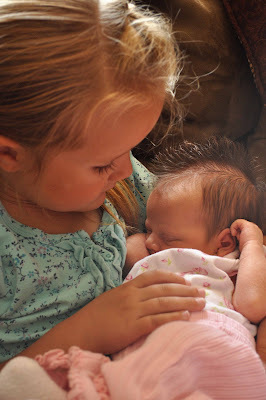 If they are like Kaitlyn, they fall asleep even through the diaper change and cannot be roused. That is okay. You can slowly add waketime like I did with her (as described in the post above). It will all come. I know that a two week old seems like she has been around for a long time because you aren’t getting much sleep. In real-time, two weeks is not that long. It might take 6 or more weeks to get playtime really happening even a little. So just relax, do what you can, and turn off the stress. Next Post First Time Mom Reflections: In Your Face! And enjoy it! Sometimes I totally miss when DD would just eat and sleep and eat and sleep. Now, she's up for 3-4 hours at a time… that's a lot of time to kill! Thanks for this! I have a 1 month old (and a 2 year old), who is VERY sleepy a lot of days! I misplaced my Babywise Book and am waiting for my new one to come, so I couldn't remember what Babywise said about this!! My son is 4 weeks old and we just started BW, and he is bottle fed. He usually takes about 45-1 hour to feed a full feeding (about 100mL/4 oz) so how much time should I be spending trying to keep him awake after the feeding and diaper change before putting him down for a nap?? Thanks! Brydson's,He won't be up much longer after the feeding. Most babies that age are up for an hour before going back down (or less). Be sure he isn't nappping during the feeding. My oldest took a long time to eat, and I finally figured out he was really getting little naps in during the feeding time.